Explanation: This meteor streaking toward the horizon through the early morning sky of January 4th is from the annual Quadrantid meteor shower. 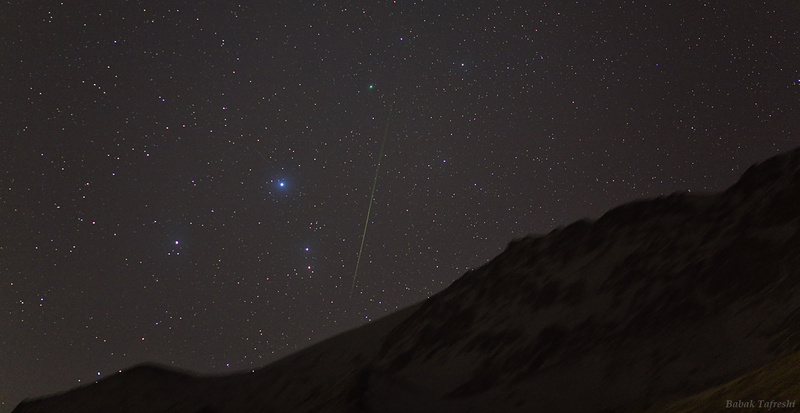 Aligned with the shower's radiant point high in the north (off the top of the view), the meteor trail passes to the right of bright bluish star Beta Scorpii. Remarkably, near the top of the trail is a small spot, the fuzzy greenish glow of a comet. Discovered in July of 2007, Comet Lulin (C/2007 N3), is too faint now to be easily seen by the unaided eye, but will likely brighten to become visible to skygazers by late February. The well-timed skyscape featuring both comet and meteor is particularly appropriate as cometary bodies are known to be the origins of planet Earth's annual meteor showers.